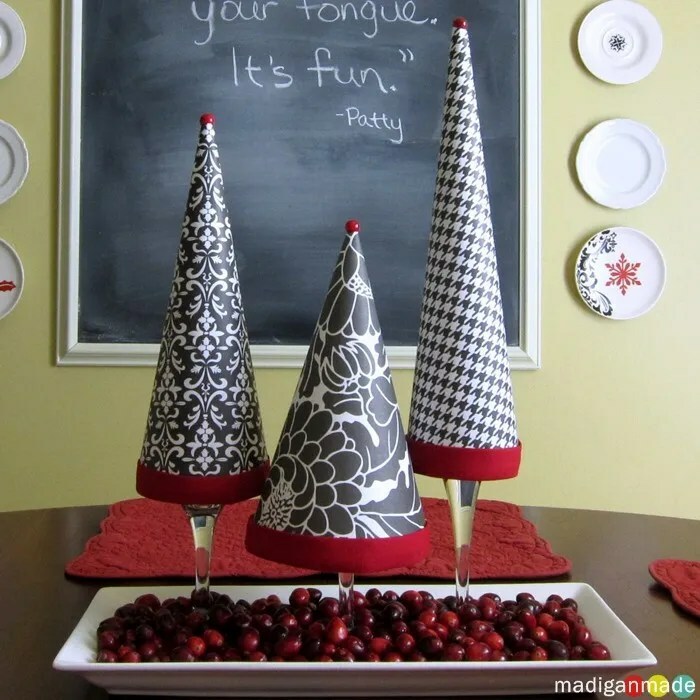 Madigan made… red, white and black Christmas trees (and a new holiday chalkboard quote). If you are new to this blog, I should tell you that I change out the quote on my big chalkboard in my kitchen every month. I change that area of my kitchen for the season, too. This month’s quote is from one of my favorite holiday films. Do you recognize it? For the kitchen area, I added a little black to the red and white colors. What I like about red, black and white together is that the combination can be vintage-y and retro. It can be classic. It can be modern. It can even be a little country/cottage. One thing it is not? Ignored. Red, black and white is a bold combination, and not always easy to work with. But I’ve used red, white and black for Halloween and for our foyer gallery wall. The combo seems to work with the rest of our home and it is a perfect scheme for the holidays. I wanted to create a centerpiece for our kitchen table to match the fabulous graphic red, black and white plates I have on the wall next to the chalkboard. But I didn’t want to go out and but new stuff to make a centerpiece. I’m known to ‘collect’ pretty scrapbook paper and I have a penchant for black and white designs: like hounds tooth, damask, or floral. Those kind of patterns are traditional… but in black/white can look updated. You can add any other other fun accent color to black and white and completely change the look of a project, too. Needless to say, I had quite a few sheets of B&W paper laying around! Cone trees are a hot trend in the DIY blog world… and I wanted to make a set of my own with pretty paper. I was inspired to make my trees after seeing these paper shade candle lanterns made with wine glasses at Casa Sugar. I did not want to put a light in my topiaries (with the tree shape, that probably wouldn’t be a smart thing to do with a flame). I thought that a wine glass would be a great base for holding up the paper trees. We have lots of wine glasses in our house! 😉 I wanted other shapes and heights to my trees, so I grabbed one of our toasting flutes from our wedding, too. Want to make some trees? Well, go grab so cute paper and wine glasses and follow along to make your own topiary trees for this season! To make mine, I first played with some old scrap paper and tape to get the width and height I wanted for each paper tree on the glassware. I just folded the paper in a cone shape and trimmed the bottom edges till they looked right. Then, I opened up those mock-ups and used each one as a template with the ‘good’ black and white paper. I cut out each shape and used double sided tape and a glue stick to keep the cone shape together at the seams. For the top, I snipped a few red berries off of an old piece of fake berry garland and glued a berry to the tip of each paper cone. And I trimmed the bottom edges of the cones with brick red bias tape scraps using my glue gun. The trim is not really necessary if you didn’t want to put it on your trees. I used the bias tape because I wanted to add a little more red AND hide some of my uneven cuts along the bottom. I think the ‘trees’ look great on this white tray and nestled in fresh cranberries. I love using cranberries for décor this time of year. If you remember (or are new here), my kitchen centerpiece last year was a simple cranberry centerpiece. This little paper tree centerpiece is simple. I love it in this area of my kitchen with my big DIY chalkboard and holiday plates. And I love the fact that except for the fresh cranberries, I had all the supplies for this project around the house. Red, white, black… and practically free!